It is a treat to watch a movie made for adults instead of the omnipresent teenage fare. Married Life, with its superb cast, its literate screenplay, which delves into the heart of relationships, and its noteworthy direction and cinematography, is that long-overdue adult film we’ve been waiting for. Set in an unnamed Northern Pacific town in the late 1940s, Married Life is the fable of Harry (Chris Cooper) who decides he must kill his wife Pat (Patricia Clarkson) because he loves her too much to let her suffer when he leaves her for his young blonde girlfriend Kay (Rachel McAdams). 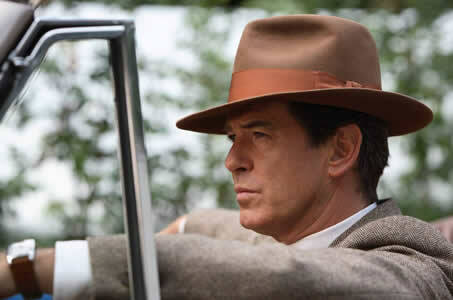 However, unbeknownst to Harry, his best friend Richard (Pierce Brosnan)wants to win Kay for himself. As Harry implements his awkward plans for murdering his wife, the other characters follow their own hearts in surprising ways. It is impossible to place this film into a particular genre, since it has aspects of 1940s suspense films, dark comedies and bits of screwball comedies—if one takes the long view. Pierce Brosnan (The Matador, The Thomas Crown Affair, The World Is Not Enough) made his difficult role seem easy—the sign of a talented and assured actor. The performance of Patricia Clarkson (All The King’s Men, Goodnight and Good Luck, Far from Heaven) as a loving and sexual woman, was outstanding. I wouldn’t have thought to cast Chris Cooper (Breach, Adaptation, Seabiscuit) in the role of Harry, but he is such a versatile actor that he played it with skill and authenticity. Rachel McAdams (The Family Stone, Wedding Crashers, Mean Girls) looked great, but she didn’t seem genuine in her role as Kay, or perhaps there just wasn’t enough meat in her role. Since a transcript of my interview with Ira Sachs, Married Life’s director, follows this review and explores many aspects of the film and its plot, let me just say that this film stayed with me. I was intrigued with the story and left wondering about how the characters’ lives would progress after the film ended.